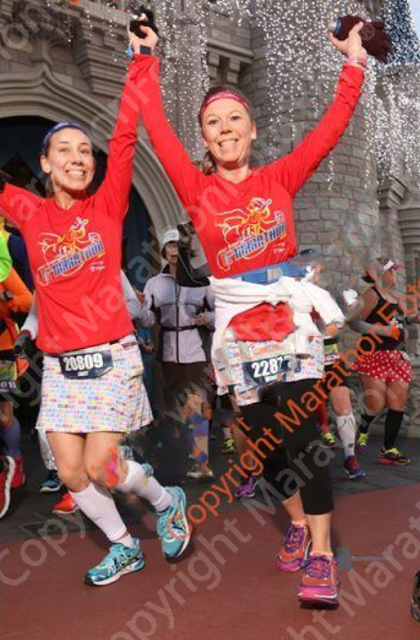 I knew that I wanted to eventually complete all the Disney races at Disney World, so when the chance to run the Goofy Challenge came up, I decided I could kill two birds with one stone so to speak. 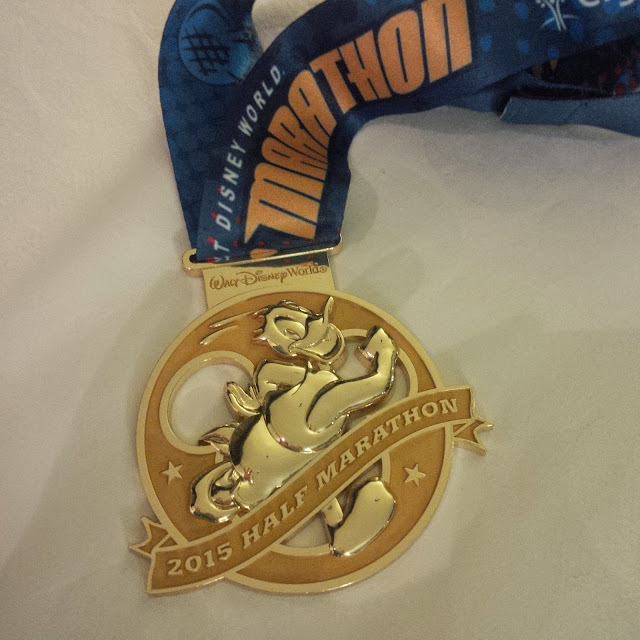 Even though the Marathon was my main race, I thought "Why not throw in the Donald Half Marathon since I want to do it eventually, and if I do it now, I'll get the cool Goofy Challenge medal". As you may have already heard on social media, the weather for the first couple of races was anything but "Florida" like. It was cold. Remember those 13.1 tank tops that I redesigned 3 times? Well, sadly they didn't even see the light of day. We ended up wearing the long sleeve race shirt over top of our tanks and I even kept my throw away shirt the entire time. I hate being cold so I even wore my compression pants under my skirt. After dealing with ITBS and lateral tendonitis in both knees, I was a little worried about how the race would go. My plan was to just take it easy and run intervals since I would be doing the full marathon the next day. I started running and I actually felt good. I did the entire first mile without stopping for my intervals. I almost started to tear up as I said to my sister "look I'm doing this, no pain". I couldn't believe it. Then I hit the 5K mark and BAM! It came on just like that. I had severe pinching in my right leg. 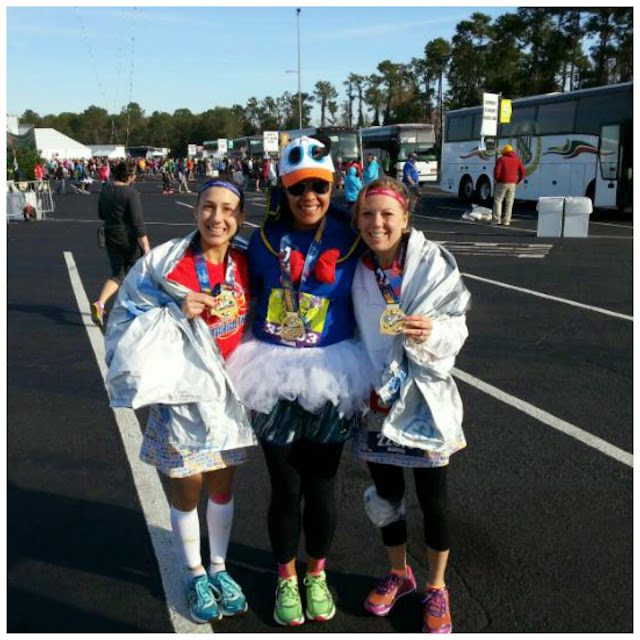 And just like that, it was Princess half marathon all over again! I did a walk, run, hobble, but that didn't prevent us from having fun and stopping for a few pictures in Magic Kingdom. I finally found a medic tent that was open where I could get Bio Freeze ( which wasn't until mile 6. I tried to stop at an earlier tent but they were not set up yet). While I was slathering on the Bio Freeze a young lady came up to the medical tent and asked "What do I do if I want to quit?" The lady at the med tent told her to take a seat and a bus would be by to take her to the finish line. I felt so bad for that young lady. 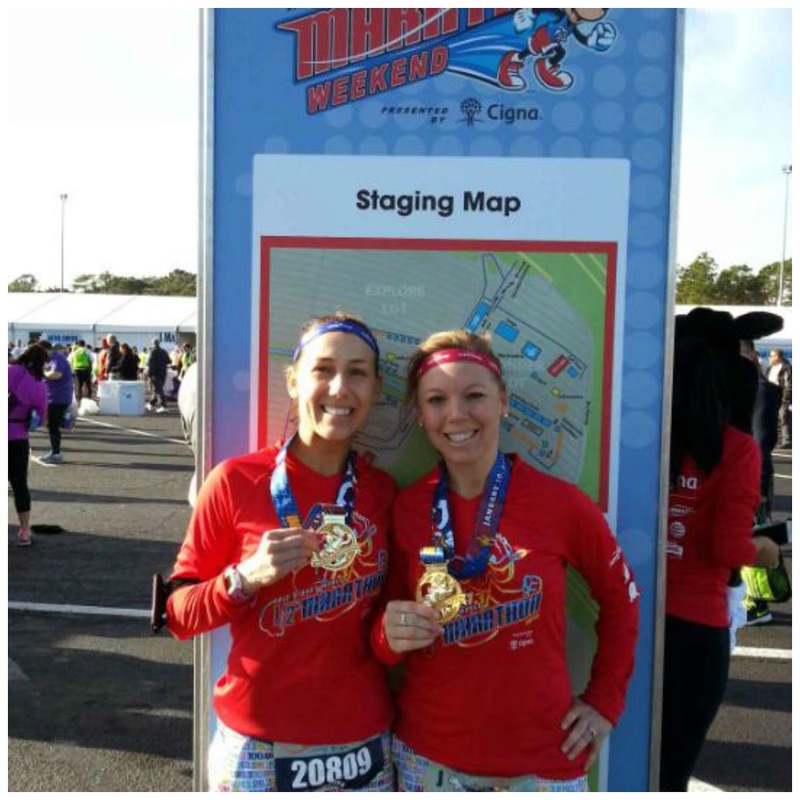 This race course was the same as the princess half marathon that we ran last year, so we knew exactly what to expect. ( Started in Epcot parking lot, went up on the highway, through the Magic Kingdom toll booth, through the TTC, pass the Contemporary, through Magic Kingdom from the side of Main Street, through Tomorrow land, around Fantasy land, through the castle, and out through Frontier land via crossing the Disney World rail road tracks. We then ran on World drive until it was time to loop back through Epcot and make our way to the finish line. There were a few times that my sister and I got separated but we always caught up to one another. I have to say that even though we took it slow, I felt like the race was over very quickly and sort of uneventful! I think that was kind of my fault though because I was in pain and I just wanted to get it over with. As we crossed the finish line I started to get a little choked up at the fact that I was able to finish this race in a decent time considering how much pain I was feeling. I have to say that I was wearing a knee strap and had been KT taped at the expo and neither of that helped. After receiving our medals I went right to the medical tent and got some ice. I got checked out by two of the nurses there and then one of the doctors came over. When I told them I was running the marathon the next day, they gave me "the face". You know, where their eyes get big and their jaw drops. Obviously they felt I was in no position to be running. When the doctor left, one of the nurses gave me a secret strategy to get through the next race. I'm really loving the half marathon medal this year! I am so happy that I was able to push through. Since it was pretty chilly out, we didn't hang out long after the race. We gathered our things and headed back to the resort for breakfast and to get ready for the meet-up later that afternoon. On our way back we ran into our friend the lovely Juliana from 4WellRules. Doesn't she look darling in her Donald duck outfit? The full marathon report will be a little more detailed. Click HERE if you would like to read about our Cook-off with Mickey Mouse the day before! You sound exactly like I did last year. I was cranky during the half and I just wanted it to be done. Great job getting through it, and honestly, by now the nurses and doctors at Disney should be used to runners pushing through to finish their Challenge. I think each year they have a different staff ( or at least the young ones are). They were really great to me though! Yes, overall, it was a good race! I did the WDW half 4 years ago. Still the best medal ever! I can't believe that girl quit! Walk, crawl, do whatever it takes to cross the finish line! I felt bad for her. She wasn't that far back, she could have easily walked it and been fine ( had she been able to walk, which it looked like she could have). I'm so sorry you were hurting. I'm sure the cold air didn't help one bit. Oh man, I bet that young lady was really bad if she quit at mile 6... so sad. Actually once I got started the cold air didn't bother me. Yes, that is a great medal! I'm so sorry that your pain started back up during the race :( Great job on finishing and looking like you were having fun! The photos turned out really well. I hope that the marathon went better and the secret from the nurse helped. It's hard to not enjoy a Disney race! I just would have liked it better had I been in better shape! Sorry you were in so much pain, but great job finishing the race! I would consider this race again someday for sure! I am sorry it was a struggle and painful, but congrats on finishing. That's a huge accomplishment. Thank you! It was worth the pain! Congrats on the finish! Looking forward to reading about the secret strategy to finishing the marathon! I don't know if it was all that much of a secret, but it was a good idea! But great job, especially when you pushed through! looking forward to hearing the recap on your marathons too!!! It actually wasn't all that bad temperature wise during the half marathon. The folks that ran the 5k and 10k the days before had it a lot worse! Thank you! It's hard to have a bad experience at Disney! Wow, can't believe you got through the marathon after the pain with the half. Hope you are resting comfortably now that you are back home and taking a bit of a break from running! Are you doing Glass SLipper Challenge next month or just the half? Yes, we are both doing glass slipper challenge next month. I don't think I will run until then. I'm all trained out! Good job finishing - you have some mighty power within! I don't think it is quite a secret, but she didn't want anyone to know that she was condoning doing what she was telling me to do! So sorry you were in so much pain! And I want to know what the secret strategy was too!!! Glad you were able to finish! 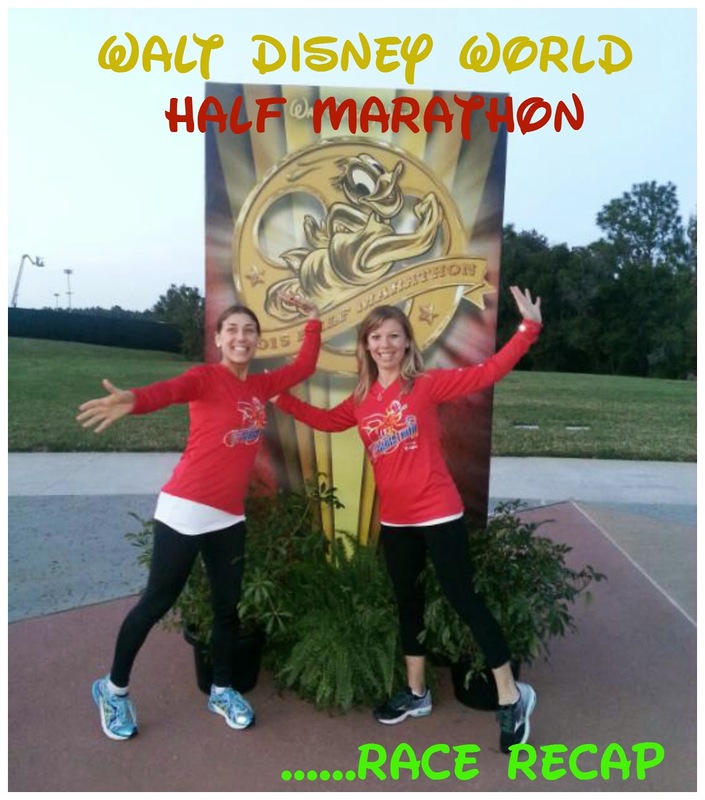 I cross my fingers that I will have at least one Great Disney race were I am not injured! So sorry you had to deal with that nagging pain during the race. I know how frustrating that can be! I hope it is feeling better now! It's not any better but i'll be working on it from now till Princess weekend. Thanks! I actually didn't hurt terribly when I walked around. It slowed me down a bit, but didn't hinder me! One down, one to go. Marathon, marathon, marathon! Cant wait to read the next one. Oh Frank, I think you will be surprised! So sorry you were in pain, but so happy you were still able to finish. I'm so sorry to hear that the pain returned mid-race! :( I'm interested to hear what the medical nurse told you as a race strategy for the full. What do you mean, a worse race? What do you know about Tendonitis?